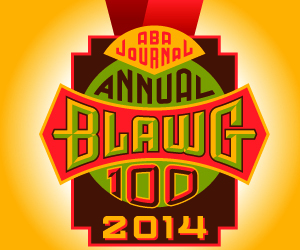 If you haven’t already voted in the American Bar Association’s 2014 Blawg 100 voting, there is still time! Understand, please, that it is an amazing honor simply to be named as one of the ABA Journal‘s best 100 law-related blogs, and to be included for the second year is stunning. And, really, quite a tribute to the popularity of genealogy among folks from all walks of life — even those oddballs who, like The Legal Genealogist, have a law degree. • the Law Library of Congress’ In Custodia Legis (in the Legal Research/Legal Writing category). • Defrosting Cold Cases (in the Criminal Justice category). • Lowering the Bar (in the For Fun category). Except… except… except that, at last report, The Legal Genealogist was locked in a ballot-box showdown with a blog about, of all things, agriculture law. But I do not want to lose out to a blog about agriculture law. I wish it was easier to vote than to have an account there with a password. Surely I don’t have enough passwords! So as much as I’d like to vote for you, I am not going to have yet another account/password. A colleague said he was finally able to register with his email address as his username, but without the @ symbol. Weird. I just cast my vote. So is that registration good for anything except voting this year? Being one of my genealogy connected cousins I know “The Legal Genealogist would never, ever, ever, do anything like countenance ballot-box stuffing”, but our competitive spirit drives us to be the best we can be…blame it on our genes! Dearest Legal Genealogist. As one who has spent more than his share of time in the trenches of politics, rest assured you are NOT guilty of “stuffing” the ballot box. That would mean cheating. Like voting dead people, dogs, and vacant lots, and so on. And it would also be illegal (well, at least unethical since it is just the internet). And we all know the Legal Genealogist would never doing anything underhanded. You are merely doing what all good pols do, and that is GETTING OUT THE VOTE. I proudly cast my vote for you last week. I think I was #286 and you had overcome the Texas Aggie crowd. Now of course, THEY can get out the vote too, so don’t let up. May the best BLAWG win! Thanks, Craig! We’ll find out early next year — sure appreciate the support. Maybe it wasn’t last week, but it was the same day you put the alert.